The papers must be submitted to the Journal of Mechanical Science and Technology electronically through the JMST editorial manager at http://www.editorialmanager.com/mest. The manuscript should be written in English and a minimum standard of the proficiency in the English language should be met before submission to the editorial office. Manuscripts should be typed in JMST template. Click here to download the template. All manuscripts must use SI (metric) units in the text, figures, or tables. Manuscripts should be organized in the following order: title, name(s) of author(s) and his/her (their) complete affiliation(s) including zip code(s), Abstract (not exceeding 150 words), Introduction, Main body of paper, Acknowledgements and References. All mathematical equations should be clearly printed/typed using well accepted explanation. Superscripts and subscripts should be typed clearly above or below the base line. Equation numbers should be given in Arabic numerals enclosed in parentheses on the right-hand margin. They should be cited in the text as, for example, Eq. (1), or Eqs. (1)-(3). Tables should be numbered consecutively with Arabic numerals. Do not add a border around the outside of tables. All tables should be referred to in the text. All the illustrations should be of high quality meeting with the publishing requirement with legible symbols and legends. In preparing the illustrations, authors should consider a size reduction during the printing process to have acceptable line clarity and character sizes. The captions of all figures should be referred to in the text as, for example, Fig. 1, or Figs. 1-3. A. A. Goldenberg and A. Bazerghi, Preview approach to force control of robot manipulators, J. Appl. Mech. 20 (5) (1985) 449-464. F. M. White, Viscous Fluid Flow, McGraw-Hill, New York, USA, (1974). beads deposited by the SAW process, Proc. of Trends in Welding Research, Gatlinburg, Tennessee, USA. (1986) 479-385. References, including those pending publications in well-known journals or pertaining to private communications, not readily available to referees and readers will not be acceptable if the understanding of any part of the submitted paper is dependent upon them. In the text the reference should be numbered in bracket in ascending order, e.g. , , etc. Single or two authors can be referred in the text; three or more authors should be shortened to the last name of the first author, like Smith et al. Manuscripts reviewed that require revision should be revised and uploaded with a response to the reviewer's comment at JMST editorial manager within two months. Otherwise, the manuscript will be considered as a new manuscript when and if it is resubmitted. 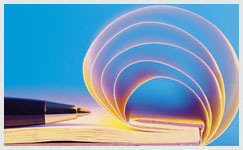 Once the paper is accepted for publication, authors must submit the copyright transfer form which is available at the journal website (http://www.j-mst.org/on_line/board/board.asp). Journal of Mechanical Science and Technology strictly follow Committee on Publication Ethics (COPE) guidelines (http://publicationethics.org/) on how to deal with potential acts of misconduct. Ethical responsibilities of Authors are located at “Ethics & Disclosures” in http://www.springer.com/engineering/mechanical+engineering/journal/12206. Galley proofs will be provided as a pdf file to the author. The author should return the corrected galley proofs within a week. Attention of the authors is directed to the instructions which accompany the proof, especially the requirement that all corrections, revisions, and additions be entered on the proofs and not on the manuscripts. Proofs should be carefully checked and returned to the JMST editorial office by e-mail if the changes are minimal. If the changes are extensive, proofs should be returned with attachment. Substantial changes in an article at this stage may be made at the author’s expense. The reprint request form must be returned with the proof. Neither the editor nor the KSME office keeps any supply of reprints. The charge for paper within 6 pages is 50,000 Won per page. An excess page charge of 60,000 Won per page within 12 pages, and 100,000 Won per page beyond 12 pages will be charged. For non-Korean authors, the page charge is not mandatory for papers within 6 pages. For papers exceeding 6 pages, a charge of $45 per page up to 12 pages and $55 per page beyond 12 pages will be applied.